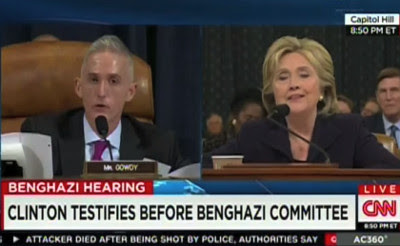 Writing at the Washington Free Beacon, Daniel Bassali offers an excellent summary of Hillary Clinton's literally contemptible testimony before the House Select Committee on Benghazi. Clinton [asserted that] 95 percent of her emails were already stored on the State Department’s server because she emailed government accounts, which are automatically stored—unlike her own private account. When asked by Chairman Trey Gowdy (R., S.C.) where she obtained this fact, which she mentioned numerous times in her testimony, Clinton cited the State Department. The following day, spokesman Mark Toner said the State Department did not provide that figure. An Inspector General report released in March said only 0.00006 percent of all emails were properly archived on State Department servers. Clinton also said she turned over all of her relevant work emails from her time in Foggy Bottom, but the Benghazi Committee proved that false when Sid Blumenthal provided them 15 emails not included in the ones Clinton turned over. More emails between Clinton and Gen. David Petraeus were found later. When confronted about how she chose which emails to hand over to the State Department and which to wipe off her server, Clinton pointed to her team of lawyers. The story of why Clinton was forced to turn her emails over to the State Department has also been refuted. She said she did so voluntarily, along with other former secretaries of state, to help “fill gaps” in the department’s records. In September, State Department press secretary John Kirby told the Washington Post that the department was made aware of Clinton’s private server by the Benghazi Committee, which requested she turn over all of her documents. They reached out to Clinton three months prior to contacting any other secretary of state. Similarly, Clinton has asserted from the time she first addressed the scandal that no classified information was ever present on her home email server. That was a lie, as literally hundreds of classified documents were discovered to have transited her private system, including "highly classified information". And it goes without saying that Hillary Clinton's lies about the Benghazi attack being motivated by a video were beyond the pale; lying to the American people, lying to the families of the dead, and lying to everyone within earshot. So, will she be placed "in contempt" of Congress for committing perjury under oath and treated according to our laws? Well? Hello? Hellllooooooooooooo??????????? Anyone???? ?